Evergreen shrubs like rhododendron, most azaleas and andromeda will feature evergreen foliage all year round, flower and then flush with new growth by summer. The benefit of flowering evergreens is that you get the best of both worlds – beautiful flowers in spring and year round evergreen foliage for privacy and structure to support the overall landscape plan. 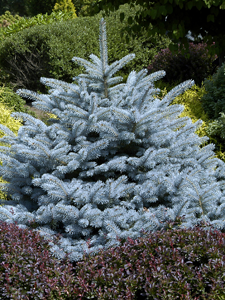 Evergreen conifers, are generally needled and retain their needles year round. Conifers can function as a unifying element in the landscape, or in some cases, a focal point. These focal points, or specimens, can add real drama to a landscape. Stop in and check out our selection of specimen evergreens. Choosing locations for evergreens requires some thought and careful planning. While they are great at creating privacy, they can also block your view – good or bad. Consider the mature size of your evergreens before you plant. Be sure to plant where your evergreens will have sufficient room to grow.